You are buying Abbott Elecare Jr. Vanilla 14.1oz Hypoallergenic Can Each, model #56585. ADW Diabetes offers a complete line of enteral feeding supplements for both children and adults. The Abbott Elecare Jr. Vanilla 14.1oz Hypoallergenic Can provides a nutritionally complete elemental formula indicated specifically for infants and children who need an amino acid-based medical food or who cannot tolerate intact or hydrolyzed protein. EleCare is indicated for the dietary management of protein maldigestion, malabsorption, severe food allergies, short-bowel syndrome, eosinophilic GI disorders, GI-tract impairment, or other conditions for which an amino acid-based diet is required. 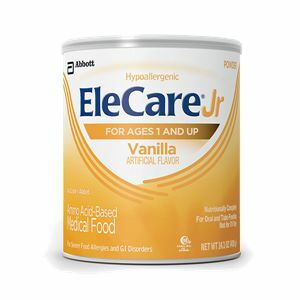 EleCare Jr is for the dietary management of protein maldigestion, malabsorption, severe food allergies, short-bowel syndrome, eosinophilic GI disorders, GI-tract impairment, or other conditions in which an amino acid-based diet is required. For children age 1 year and older. For oral or tube feeding. For use under medical supervision. Clinically documented to be hypoallergenic, to virtually eliminate the potential for an allergic reaction to the formula in multiple-food-allergic infants. Shown to be effective in maintaining growth of children with cow's-milk protein allergy when used as the primary source of calories. 33% of fat blend as medium-chain triglycerides (MCTs), an easily digested and well-absorbed fat source. Corn Syrup Solids (54%), High Oleic Safflower Oil (9%), Medium-Chain Triglycerides (8%), Soy Oil (7%), L-Glutamine (2%). Less than 2% of the Following: L-Asparagine, L-Leucine, DATEM, L-Lysine Acetate, L-Valine, Calcium Phosphate, L-Isoleucine, Artificial Flavor, Potassium Phosphate, L-Arginine, L-Phenylalanine, L-Tyrosine, Potassium Citrate, Sodium Citrate, L-Threonine, L-Proline, L-Serine, L-Alanine, Magnesium Chloride, Glycine, L-Histidine, L-Methionine, Ascorbic Acid, Calcium Carbonate, L-Cystine Dihydrochloride, L-Tryptophan, Magnesium Phosphate, Choline Chloride, Aspartame, m-Inositol, Acesulfame K, Ferrous Sulfate, Taurine, Ascorbyl Palmitate, Zinc Sulfate, dl-Alpha-Tocopheryl Acetate, Sucralose, L-Carnitine, Niacinamide, Salt, Calcium Pantothenate, Manganese Sulfate, Thiamine Chloride Hydrochloride, Cupric Sulfate, Vitamin A Palmitate, Riboflavin, Pyridoxine Hydrochloride, Folic Acid, Beta-Carotene, Biotin, Phylloquinone, Chromium Chloride, Potassium Iodide, Sodium Selenate, Sodium Molybdate, Vitamin D3, and Cyanocobalamin.